Honeybees have fascinated scientists for decades...and for good reason! The beehive is a delicate colony where each sector of the community must play out its well-defined role in order for the community to survive. There are 3 types of honeybees: the worker, the drone and the queen - none of which can live on their own. The honeybee is not born knowing how to make honey; the younger bees are taught by the more experienced ones. Some worker bees are nurse bees. Their job is to feed the larvae. A honeybee visits between 50 and 100 flowers during one collection flight from the hive. One bee colony can produce 60 to 100 pounds of honey per year. An average worker bee makes only about 1/12 teaspoon of honey in its lifetime. At the peak of the honey-gathering season, a strong, healthy hive will have a population of approximately 50,000 bees. It would take approximately 1 ounce of honey to fuel a bee's flight around the world. A Cornell University paper released in 2000 concluded that the direct value of honeybee pollination to U.S. agriculture is $14.6 billion annually. We should appreciate honeybees for their honey and pollination services. 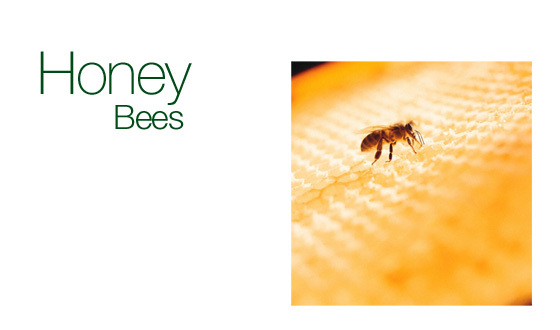 80% of the pollination of the fruits, vegetables and seed crops in the U.S. is accomplished by honeybees. Honey is the primary food source for the bee. The reason honeybees are so busy collecting nectar from flowers and blossoms is to make sufficient food stores for their colony over the winter months. The nectar is converted to honey by the honeybee and stored in the wax honeycomb. The United States has an estimated 211,600 beekeepers.